FUNDING BOOST: Andrew Clements presents a cheque for $2500 to former Kirby Financial Solutions principal John Kirby on behalf of the Count Charitable Foundation. 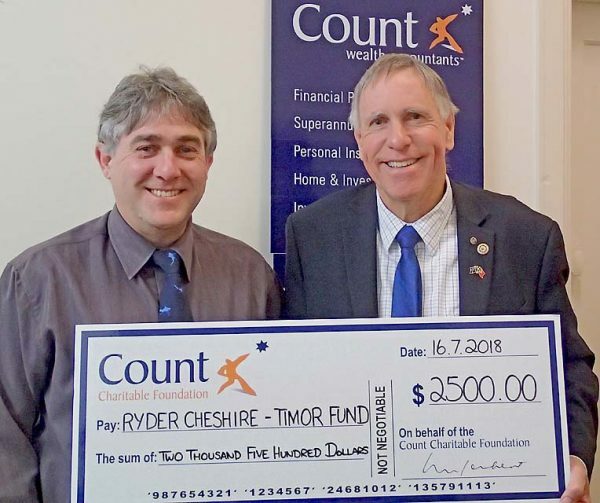 RYDER-CHESHIRE Australia’s Timor facility Klibur Domin has received a boost after receiving a grant from the Count Charitable Foundation. Kirby Financial Solutions Tax Accounting and Financial Planning new principal Andrew Clements said the firm had been contributing to the Count Charitable Foundation for nearly 10 years. “It was now time to seek a return of some of the monies donated,” Mr Clements said.